Location: Vareseweg 143 3047 AT, Rotterdam Netherland. 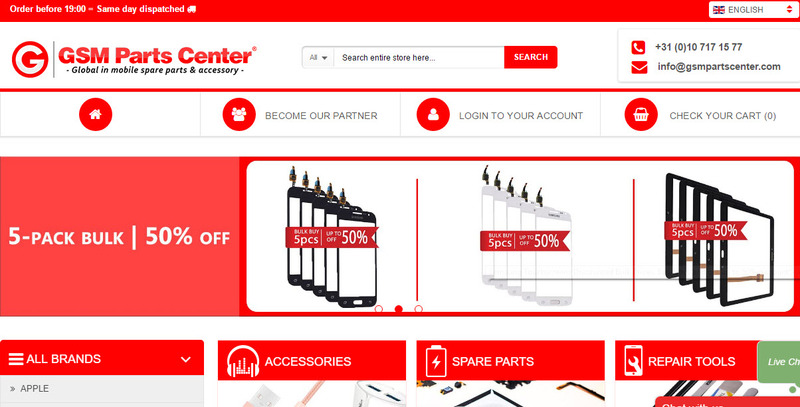 Wholesale in Mobile Phone Spare Parts & Accessories in Holland - GPC is an abbreviation for GSM Parts Center. GPC is part of the GSM SUPPLY group, a company specialized in supplying spare parts and accessories for clients such as: repair centers, telecom businesses, and shop owners. On this project, we must build from zero. Besides Magento, we must create an ERP system via Yii (PHP framework) to manage product, customers and orders. Client wants all products in ERP sync with Magento and when customer place an order in Magento, it'll be sent to ERP system. This project is using multi languages, so I used multi stores to manage languages. Besides that, we must optimize page speed, server cache (using Redis and Memcached). This website also friendly with search engine and has a lot of keywords on the top google search.